In April 1994, the Rwandan genocide left an estimated 800,000 dead, most of them ethnic Tutsis. Haaretz hears the remarkable stories of three couples who have reconciled themselves with past horrors and found love and some form of redemption. Twenty years ago, in the small, landlocked, east-central African country of Rwanda, members of the Hutu ethnic group turned on their neighbors, friends and family of the ethnic Tutsi group and began slaughtering them. Starting in early April of 1994, and during the course of the next 100 rainy days, an estimated 800,000 Tutsis and their moderate Hutu sympathizers were murdered. But these are not stories recounting that genocide. These are love stories – tales of men and women, like men and women the world over, who find someone with whom to share a first kiss. These are couples with dreams and disappointments, good moments and bad. That said, these couples, forced to live out their relationships in a time of unimaginable horror, do end up telling a story about the genocide after all. It's a story we don't often hear – one of resilience and redemption. One about picking up the pieces, forgetting, if only a little, and forgiving themselves and each other, as much as might be possible, and moving on. Agutsine Nkurikiyinka was a broken man when he was released from jail. His wife had died of malaria. His two daughters, after a decade apart from their father, barely knew him. He had lost his job and home, and been reduced, so he felt, to nothing less than a perpetrator of genocide. As many as two million people, practically all from the Hutu ethnic group, are believed to have participated in one way or another in the genocide that occurred in Rwanda in the rainy spring season of 1994, leaving 800,000 of their neighbors, friends and family – the vast majority of them Tutsi – dead. Just before the genocide began, Agutsine – a mild-mannered son of Hutu farmers in Kimironko – had found a new job he was excited about: Working for the agriculture ministry, as a guard on a forest conservation project. On April 7, 1994, the day after President Juvénal Habyarimana’s airplane was shot down on its descent into the capital, Kigali, he set out to erect a roadblock. A thin woman with cropped hair, Christine Bamurange grew up working in her parents’ beer and soft drinks kiosk. The last of eight children, she was the one pulled from school when her parents’ business started doing badly, so she never learned how to read or write. She was married off young – to her neighbor Sylvester, a fellow Tutsi, who, after producing three children with her, left for the Ugandan border to fight with the Rwandan Patriotic Front. When Habyarimana’s plane crashed, Christine’s father instructed everyone to hide under their beds. “I don’t want to die under a bed,” she said, and set off in the middle of the night. “I knew I needed to take my children and run, though I did not know where to go,” she says. Ten members of Christine’s family would eventually be killed in the genocide. Sylvester survived the war, but, injured in the fighting, died of his wounds. It was, Agutsine maintains, a fake roadblock. " Thousands of Tutsi were fleeing along the roads, trying to get to churches for safety. As Hutus, and government workers, we were not allowed to stay at home. We were being dragged from our houses. We needed to pretend we were doing something, to show we were part of the fight,” he says. A month later, with reports of the RPF’s progress and fearing reprisal killings, Agutsine and his young wife, Anatlya, took to those same roads, joining the masses of Hutus fleeing toward refugee camps in the Democratic Republic of the Congo (then Zaire). Agutsine’s mother died in the camp, of cholera, and his second child was born there. After two years, he decided to return home. He was arrested almost immediately. “It was not hard to identify me. We all knew each other,” he says. It was the beginning of 1996, and the country's prisons – originally built to house 10,000 inmates – were bursting with some 130,000 accused génocidaires, all awaiting trial. Inmates were packed in with no space to sit or lie down. At one point, 10 were estimated to be dying every day from disease and suffocation. Some stood up and pointed accusing fingers at him. Others vouched for his moderate behavior. One man, who accused Agutsine of killing members of his family, was found to be confused. An old lady helped his case by telling how Agutsine’s brother refused to kill her family – and was himself killed as punishment. The court acquitted Agutsine and set him free. It was there, at that trial, that Christine first saw Agutsine. Christine did not mention the budding friendship to her family. “The whole country was talking about reconciliation and reintegration, and we all knew we had to accept living side by side. But deep, personal forgiveness? That is something else,” she admits. “I came in and noticed a very pale woman,” says Peter, who had been invited over for lunch by one of Gertrude’s older sisters. “Pale and beautiful.” Gertrude was struck by his smile. “That, and the way he spoke. He had a way with words,” she says. Peter had gone off to Kigali to work at an electric company. Gertrude, a seamstress, stayed behind in her village, helping on her parents’ farm. The two did not speak to each other, or even exchange letters, for all that time. “I cannot explain the sentiments, but even though I had other girlfriends in Kigali, Gertrude was the one on my mind,” says Peter. “After three years, he returned and asked my father for my hand in marriage,” says Gertrude, who is keen to point out she had other suitors too, but dismissed them all. The two had never even held hands, much less kissed, before they got engaged. “That is how it is in Rwanda,” she says. “In the countryside,” adds Peter. “I agreed to marry him because he seemed a good man,” she says. “Our relationship was very strong,” adds Peter. She was a Tutsi and he was a Hutu, but this mattered little to them at the time. 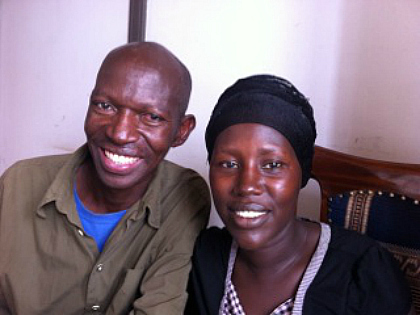 They spent a week together after their engagement, before Peter returned to Kigali. “That is when we finally kissed,” says Gertrude. “And more…” adds Peter. Peter and Gertrude were apart when the killing sprees began. Gertrude and her family fled into the bush, surviving off herbs and tree bark. Her father was thrown into a well and stoned, just a week before Gertrude realized she was pregnant; before she could tell him that his favorite daughter would soon make him a grandfather. They named their firstborn son Tuyishime Reginardin, which means “Thanks to God” in Kinyarwanda. They married in a small ceremony and, with the hundred days of killing over and the country quieting down, tried to start life again, this time together, in Kigali. “The genocide sat heavily on us, so it was hard to be truly happy, but we were happy enough,” says Gertrude. “Our love helped us survive,” says Peter. “But our lives were not without challenges,” adds Gertrude. One of those biggest challenges came when their fifth child was born, years later. The baby’s skin looked strange. Concerned, Peter sat Gertrude down to confess a secret he had kept from her for six long years. “After the genocide, I had affairs with other women. A lot of women. There were so many lonely survivors who had lost their husbands in the capital – and they needed someone to help with money,” Peter says. “It was not prostitution, but it was a crazy time…” His voice trails off. He is, today, ashamed. “It is hard to explain,” he says. When Peter tested positive for HIV, he was scared to tell Gertrude. “I felt terrible. But I could not tell her.” It was only the concern that the baby might also be infected that forced him to confess. When Gertrude tested for HIV, she was told she was negative. “I thought it was a mistake. That the machine was broken, but it happens. I did not infect her. We are called a discordant couple,” explains Peter. 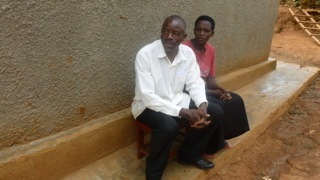 The couple now perform volunteer work counseling other discordant couples at a Kigali AIDS center. “We teach others how to live with the disease and forgive each other,” says Gertrude. “This is a country that needs reconciliation. We need to let go of our anger. “We remained a unit,” says Peter, who in the past year has been in and out of hospitals, which cost him his job and forced his youngest children to leave school. Gertrude makes sure he takes his medicines on time and rubs his head when he gets fevers. 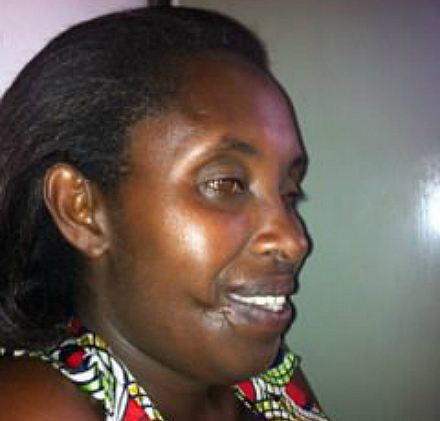 Chantal Umanyirigira has a deep scar that runs across her cheek and pulls at the side of her lip. “I don’t like it,” she says, raising her hand to her face. But her hand too is scarred, as are her chest, legs and scalp. It was a particularly rainy week, she says, recalling the incident 20 years ago. An Interahamwe (Hutu militia) group overran her on the road and hacked her body with pangas. They raped her repeatedly in front of her children and cut off one foot so she couldn't escape. Then they left her to die in the torrential rain. Years before all this, she was a pretty girl. The prettiest, she boasts, in the small village where she grew up: the middle child among a poor Tutsi farmer’s brood of seven. And that is why Sebastien Nengo, a neighbor 11 years her senior, wanted her as his wife. “I did not love him, or even like him,” says Chantal. “He was a Tutsi farmer, too, the older brother of a school friend. I barely knew him. But in our culture, you can be forced,” she explains, describing the traditional, albeit increasingly infrequent, practice of forced marriage. Lying there in the rainy gutter that April day, though, Chantal wondered if she would ever see her husband again. “We had all been hiding in the Catholic church in Nyamata, when the perpetrators came and set it on fire,” she says, slowly beginning her story. “We were so stressed that we got separated. Mama and my brothers took one route. I took another route with my girls, and Sebastien joined a group of fighters trying to hold back the attackers.” She believes that their never-found son was burnt to death in the church, together with his cousins. In time, Chantal would learn that her father, all her siblings, save one sister, and all of Sebastien’s family had also been killed in the genocide. Finally, through the haze, she heard Sebastien’s voice. She thought she was hallucinating. But there he was. He had been searching for her. He knelt down and covered her naked body with his shirt. “There was nowhere to go. Nowhere at all. I did not know if he could protect me. But I knew I could trust him. Sebastien put me on his back and carried me out of the gutter,” she says. This story was originally published on April 29, 2014.